I know its only [tag]November[/tag] but the holidays are really just around the corner. Once [tag]Halloween[/tag] is gone, it seems like its a full-on sprint into the [tag]winter[/tag] [tag]holiday[/tag]s.
If you have the time, one nice way to open the season is to make a batch of beautiful [tag]sugar cookies[/tag]. 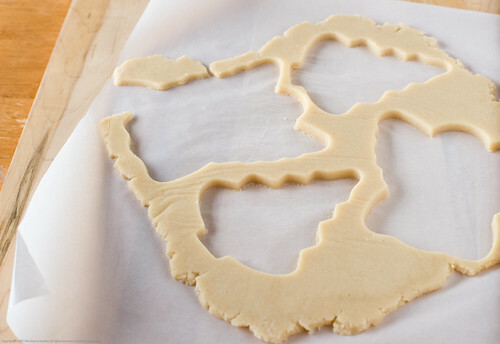 Perhaps a [tag]turkey[/tag]-shape would be best right now and I might do some of those for [tag]Thanksgiving[/tag] but today’s post shows [tag]Christmas[/tag] cookies (because I do not have other types of [tag]cookie cutter[/tag]s) that go for a good cause! By the way, I will be blogging soon on how we are NOT doing a turkey this year and something completely different but hopefully just as satisfying. Are you thinking of drop-kicking the overgrown [tag]poultry[/tag] and going for something brand spanking new? If yes, let me know what your up to! Lydia of [tag]The Perfect Pantry[/tag] and [tag]Nine Cooks[/tag] has been running a wonderful community building event for years now called [tag]Drop-in & Decorate[/tag]. I am going to borrow from her site to give you the details. “Drop In & DecorateSM [tag]Cookies for Donation[/tag] is a simple concept: bake some cookies, invite friends or family (or neighbors, or co-workers) to drop by and help decorate, then donate your cookies to a local [tag]food pantry[/tag], [tag]emergency shelter[/tag], [tag]senior center[/tag], [tag]lunch program[/tag], or other [tag]community agency[/tag] serving [tag]neighbor[/tag]s in need. Drop In & Decorate parties have become a wonderful [tag]tradition[/tag] for many [tag]friend[/tag]s and [tag]families[/tag] a way to “give back” and have fun, too. To start your own tradition, download our free “How to Host Your Own Cookie Decorating Party” Guide (click here). Includes [tag]recipe[/tag]s, supply sources, and how to donate. Read about Drop In & Decorate parties here. Meet our recipient agencies and partners, and learn how and where to donate your cookies. What’s in the [tag]King Arthur[/tag] Drop In & Decorate Baking Kit? Click here for details. Today I am going to share with you Lydia’s truly fantastic recipe for these sugar cookies that can put up with a LOT of [tag]icing[/tag]. Its much more of a [tag]shortbread[/tag] and that, my friends, is ALWAYS a good thing (ok, maybe not for the hips, but the lips say “Yes, please, ma’am”). I hope Lydia doesn’t mind my sharing this recipe here. Its my hope that you try it, see how fantastic your cookies are and then you become inspired to host your own Drop-in & Decorate party this year! 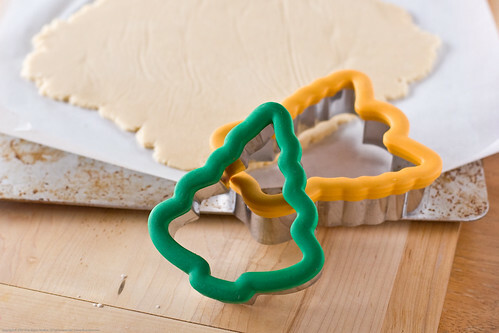 Reprinted from the archives, our best, most delicious sugar cookie recipe. See note below for making multiple batches. 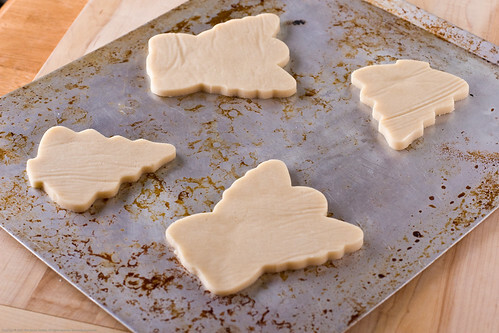 Makes 16-20 large (4-5 inch) sugar cookies. Preheat oven to 375Ã‚Â°F. Line a couple of baking sheets with a Silpat or parchment paper. In a large bowl, stir together flour, baking powder and salt. In another large bowl or the bowl of a heavy-duty stand mixer, beat together the butter and sugar, until fluffy. Add egg, milk and vanilla, and continue to beat until well blended and smooth. Beat flour mixture into the butter mixture until smooth. Divide dough in half. Place one half on a sheet of parchment paper or wax paper; cover with another sheet and roll to 1/4 inch. Repeat with second half of dough. Refrigerate dough for at least 30 minutes, or up to a couple of days (or, if making far in advance, you can freeze at this point. Wrap sheets tightly in plastic wrap). Remove one sheet from the refrigerator; peel off the top wax paper, then replace paper and invert dough. Peel off and discard what is now the top sheet of paper, and cut out the cookies. (cookies will spread, so do not place too close together on the baking sheet). After the cookies are completely cooled, decorate with Royal Icing. 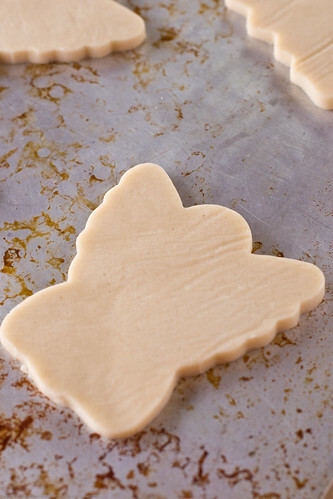 Place the decorated cookies on a tray and leave out overnight, uncovered, to harden. The next morning, package in food-safe cellophane bags or cookie tins. *Note: to make multiple batches, do NOT double the recipe. ItÃ¢â‚¬â„¢s hard to control proportions. Instead, make multiples of the original recipe, one batch at a time, for guaranteed success! *Another note: Rolled sheets of cookie dough can be made ahead and frozen (or, if you’re going to use them within a day or two, you can stack the rolled sheets of dough on a cookie sheet in the refrigerator). 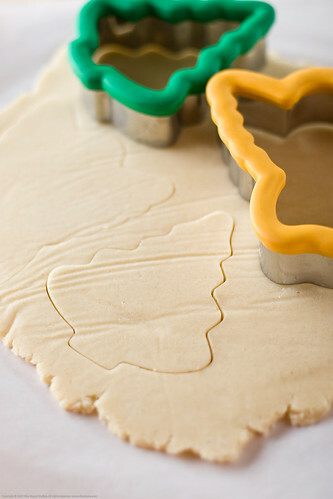 Let defrost until dough is pliable enough to be cut without breaking cookies, but not necessarily completely defrosted. I will post again once I decorate these babies and shoot them. Be patient! Nika, your cookies look perfect!!! Thank you so much for your lovely post and for helping to spread the word about Drop In & Decorate Cookies for Donation. Now I cannot wait to see your decorating ideas! What a wonderful reason to bake cookies!! I am going to do a whole bunch of holiday baking for gifts for family and friends. I should try this as well. Vegan_Noodle: ooh, those sound super delish. Alas, I fear that animals will lose their lives for our T-day feast, sorry! It just wont be the mega-carcass that many people do on T-day. I love these pics, Nika. And it’s been great seeing your logo all over the place!